What happens when you blindly trade with a very dumb script in the year range 2000-2015. 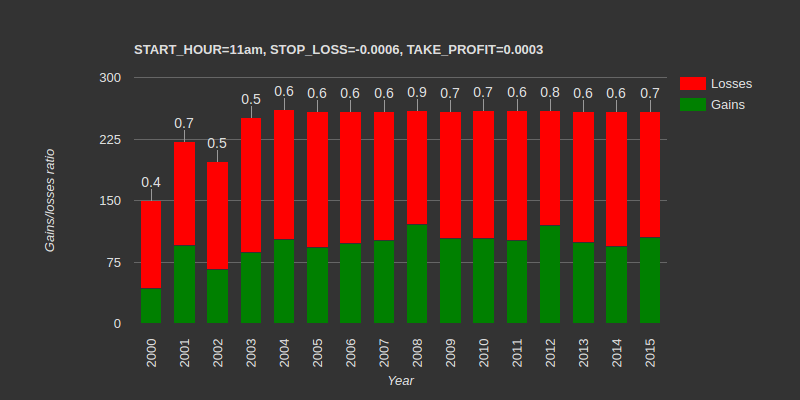 Recently I wanted to do an experiment with algorithmic trading with the EUR/USD cross pair. However, instead on focusing on winning strategies and super-fancy mathematical models I decided to start from an unsophisticated approach. I built a very naive robot that just trade at a specific hour of the day and quits if any gains or losses occur. Definitely a naive approach here, and that's exactly what I wanted. TAKE_PROFIT (in pip) - stop trading if value goes above (gain). I played with those three variables, by tweaking the values and varying the stop loss/take profit range. I restricted the experiments from 9 am to 11 am because, given my previous analysis on EUR/USD volatility, that period seems to be the most lively, in terms of trading activity. I run my tests from year 2000 to 2015. What follows are the results in form of raw numeric outcomes. Below you can find the previous raw data organized in nicer charts. Each drawing shows one trading experiment. Stacked bars are gains (green) versus losses (red). Vertical axis contains the trading days, which are roughly 250 in each year. The number above each bar represents the gain/loss ratio: if greater than zero, gains overcome losses. Bars for years 2000, 2001 and 2002 are shorter because of some missing data. I must admit I was definitely suprised by the results. Initially I thought that, being just random and dumb trading, every outcome would be a complete loss. However my experiments turned out to be victorious several times. Take a look for example at the chart of Result 2: in year 2002 the gain/loss ratio is 1.1, which means I was able to make actual money from my naive trading! Now, if you think of that experiment as a starting point, I guess what one should add in terms of strategies, heuristics and algorithms in order to raise those gain/loss ratios at least to 1.1, knowning that a complete dumb strategy like mine that can bring you close to a gain/loss ratio of ~0.5 (roughly the mean of all ratios).